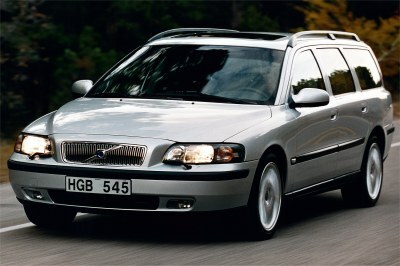 The V70 is the wagon version of the S60 sedan. Engine choices include: 168-bhp/2.4L I-5, 197-bhp/2.4L turbo I-5, and a 247-bhp/2.3L turbo I-5 (S60 T5). Dynamic Stability and traction control (DSTC) are optional. A 5-speed manual or 5-speed automatic transmission are available. A Geartronic 5-speed automanual, 16-inch wheels, child booster seats, CD/GPS navigation system, 150-watt audio system w/subwoofer, and leather seats are optional. A complete passive safety airbag package includes side-curtain airbags.